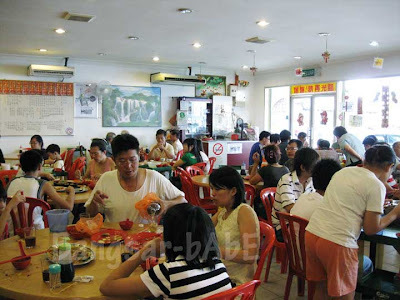 Dad wanted to try the tai chows in Seri Kembangan, so we went there on Mother’s Day. 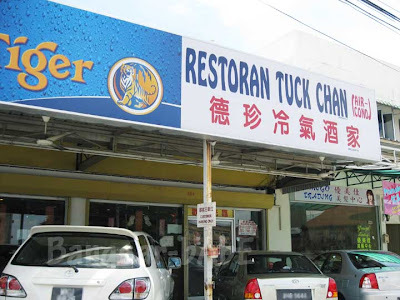 Since we were not familiar with the place, we settled for this restaurant called Tuck Chan, a place rif used to frequent when he was little. 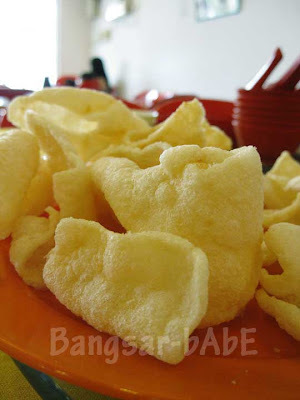 Once we were seated, they served us a plate of prawn crackers. Nice and crispy, I prefer this to the usual (boring) salted peanuts. 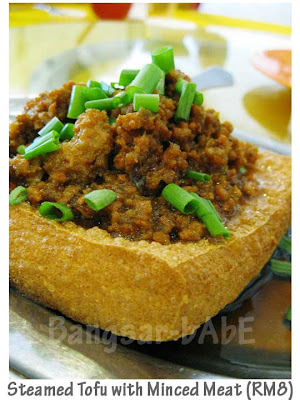 Since we didn’t know what was good, we placed our orders based on the Si Tau Por’s (lady boss) recommendation. The tofu was quite good; it was crispy on the outside, yet firm and silky on the inside. I especially liked the savoury minced pork and radish topping. It complemented the tofu nicely. A pity this was a small portion, as I really wanted to have more. The deep fried pork slices with supreme sauce was one of their best dishes (according to the si tau por), so we ordered a plate to try. The sauce was too salty, and the pork slices were hard and tough. It felt as though I was chewing on pork jerky. Not worth ordering, if you asked me. I thought the “Ham Yue Fah Lam Pou” was lacking its key ingredient, salted fish. The tender, fatty pork belly was coated with a thick layer of black sauce. If it wasn’t called “Ham Yue Fah Lam Pou”, I would say this was quite a decent dish. But since there’s the word “ham yue” in it, it did not make the cut. 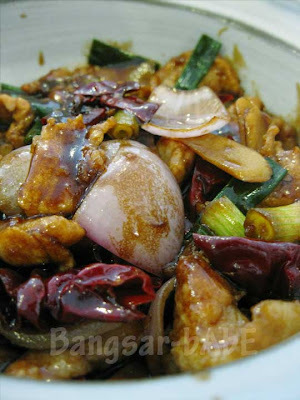 The spring onion ginger with fish slices was one of the better dishes that day. 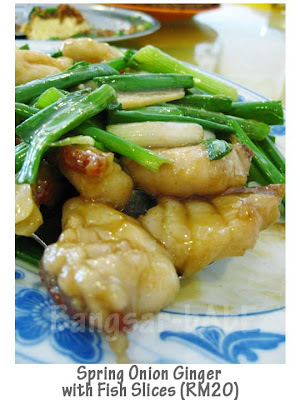 The fish slices were meaty and tender, while the spring onions were nice and crunchy. However, I was slightly annoyed to find more spring onions than fish slices on the plate. We ordered two types of vegetables, and it felt as though they were both given an oil bath. 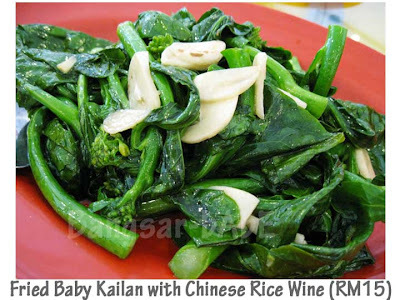 Of the two, I liked the baby kailan better. It was lightly seasoned and had lots of crunchy garlic slices. 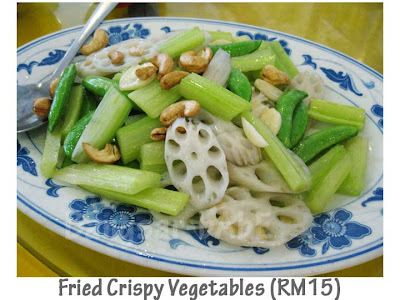 I didn’t like the fried crispy vegetables, it was too bland in my opinion. The rest of us didn’t like this either. Dad loves eating Cantonese Fried “Yin Yong”, so we ordered a plate to try. The gravy was very starchy, and there was hardly any egg in it. Although the beef slices were tender, they were hardly a compensation for the bland, gloppy gravy. The ice cream was complimentary, which I thought was very nice of the restaurant. rif loved coming here as a child, because he wanted the ice cream. When they placed the ice cream on the table, he got super excited, it was hilarious! Lunch cost RM122.70 inclusive of drinks for the 6 of us. Prices were reasonable, but I found the food very average and slightly on the oily side. Verdict: Reasonable prices, average-tasting food. tried there a while back. haruan, deboned, sliced and stir fried. try it next time if you are there again. 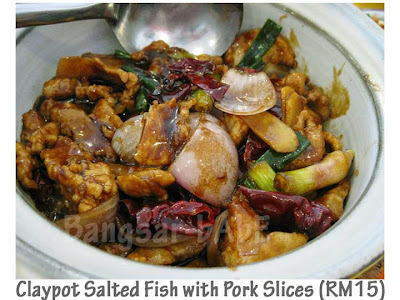 2 pork dishes? 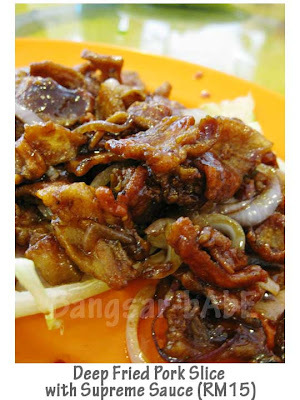 u can get a really good version of the supreme sauced pork in gohtong jaya..but it is abit on the hard side, like jerky.. I use to go there for lunch a few years back but I still remember their food is delicious. I remember we used to order their fried kembong fish. Is very crispy and taste good but not sure now. Have to go and try again. Ah well, though the food was rather average but still there was the tofu to start with, right? I think i will be like rif – go there for the cute ice-cream lah, LOL! Havent seen those around for a longg time now. leo – Bukit Tinggi? I’m not familiar with that place…you show me how to go lar! LFB – LOL, I feel the same way about tofu too!! 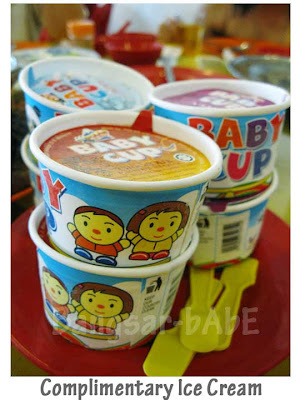 I just doubled over, absolutely thrilled, when I saw Baby Cup! HEHEHEHE!! It’s without a doubt the highlight of the meal, and I totally second Rif’s reaction! leo – Thanks…gosh, you know all the ulu-ulu places! nomad – Hahaha…I still remember your facial expression when you had the super salty sausages at Bellygood! Teehee…..
hmm.. can see alot of food here. where’s the pillow? it was crispy on the outside, yet firm and silky on the inside..! sounds like a gr8 tagline for an ad! i too luv hamyee farlam. too bad a lot of plcs mk it too salty! the ice cream, brings back childhood memory when i was young to keep hunting for it yet my parents don allow. heee..
taufulou – Not to say not good…it’s a matter of preference. Based on the earlier comments, I probably missed out on the nicer dishes.